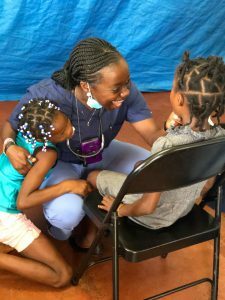 (June 9, 2018) – Great Expressions Dental Centers (GEDC) orthodontist, Dr. Ciera Scales, recently served more than 200 patients during a mission trip to rural Jamaica put on by Meharry Medical College School of Dentistry and the Jamaica Awareness Association of California. The mission trip to Jamaica offered comprehensive care to patients of all ages who live in underserved communities in the country, which included educational components along with medical, pharmaceutical and dental services. Dr. Scales led a team of four dental students chosen to attend by Meharry Medical College School of Dentistry and traveled more than an hour into the mountains to treat citizens who only receive medical care through mission trips-often several years a part. In addition to health services, the Jamaica Awareness Association of California offered scholarships and tablets to five children who passed the entry exam to secondary school – a rare opportunity for many children in the community. Each student chosen had passed the entry exam with a 96 percent or higher and were honored at the closing ceremony of the trip. Throughout the year, GEDC professionals participate in initiatives and donation opportunities to better the communities they are privileged to serve, as well as communities around the world.